at the Minnesota Landscape Arboretum in Chaska. 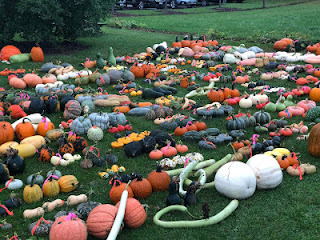 The pumpkins, squash and gourds are laid out and tagged by variety. The couple grows specimens from every continent (except Antarctica), from countries like Thailand, Italy, France, China, Russia, and Japan. Out of those, 330, 315 produced fruit. 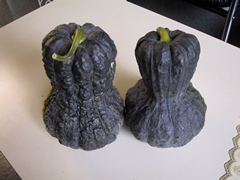 Ever heard of a 'Speckled Hound' squash? The Thulls are always on the lookout for unique varieties.that are easy to grow and taste good. 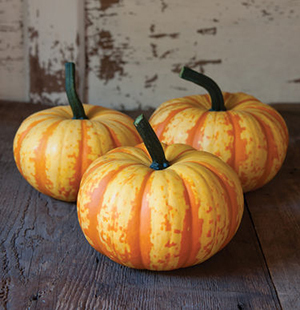 How about a Speckled Hound squash? Its squat, pumpkin-like shape features orange sides with pink and blue colors dripping over the top and sides. Thanks to its sweet and nutty tasty flesh, it's considered a culinary delight and makes great pies! Striped blaze pumpkin vines produce a lot of fruit. Australian Butter: Popular heirloom variety with great taste and a rustic, bumpy orange appearance. Wolf: Large, reliable jack pumpkin with a huge handle. Easy to grow and produces lots of pumpkin on the vine. 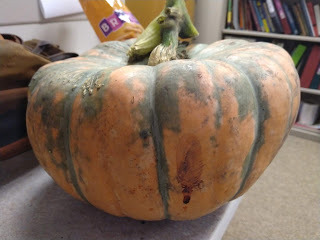 Red Warty Thing (Victor): Bright red squash with a distinctive shape, covered in warts. Octoberfest: Large, dark orange pumpkin with a good sturdy stem--great for making jack-o-lanterns. Average size of 18 pounds! Blaze and Spark: Newer, popular variety with orange and yellow stripes, slightly flat and compact in shape. A three-pound pumpkin, 7 inches in diameter and 3.5" high. 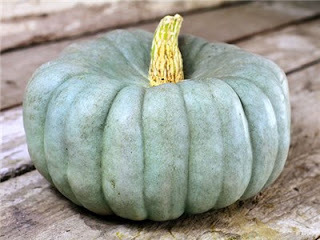 According to Jenny, blue pumpkins have grown in popularity thanks to the Teal Pumpkin Project. A blue pumpkin by the front door at Halloween means the household is offering alternatives to kids with food allergies (usually non-food items). But you don't have to paint your pumpkin blue! Good blue varieties to showcase on your front steps include Jarrahdale, Queensland Blue, and Blue Doll. You can show off a pink squash, too, with the Marina di Chioggia or Australian Butter. A Jarrahdale pumpkin on your porch lets trick-or-treaters with food allergies know your house has safe treats. 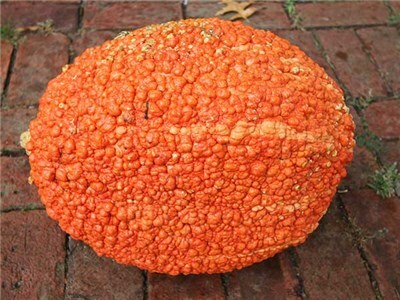 Some Japanese and Chinese squash date back to the 1600s and have unique shapes and a variety of color patterns. 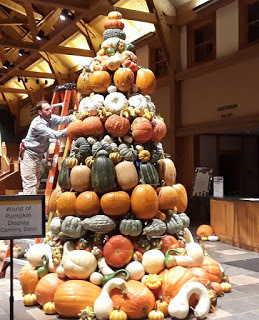 The Thull's say you can store them for months in a cool spot until January or February. Some varieties to try include Shishigatani, Yuxijianbinggua, and Chirimen. Are you an Acorn or butternut squash fan? The Thulls are always on the lookout for the best texture and flavor. Some of their favorites include Honey Bear, Tuffy and Honey Boat Delicata, the latter of which has more of an oblong shape. As for butternut squash, try Canesi, Butterscotch, Rogosa Violina, and Gioa, which sport smooth flesh texture and complex flavors. 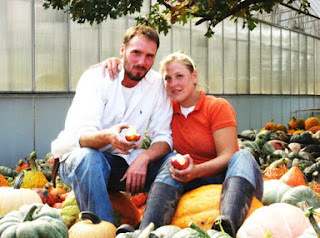 The Thulls say they watch out for two things when growing pumpkins, squash or gourds: wet weather and weeds. If the temperatures are consistently warm in May or June, plant seeds directly into your garden. But make sure the soil is not too wet, because the seeds could decay and rot. If rain is forecast, plant them at a shallower depth so they won't be sitting in water. Weeding is important. A couple of weeks before the Thulls plant their crops, they dig up the soil to allow weeds to emerge. They hoe or till once more right before planting so the squash aren't competing with the weeds.